The transcripts of both WMSC meetings that dealt with McLaren have been published and, predictably, most people are finding the minor revelations they contain and concentrating on those. So yes, it appears that Ron Dennis and Fernando Alonso are not the best of friends at the moment. And yes, it was Ron who informed Mosley about the drivers' emails initially, but it was Bernie who notified him of their existence after Alonso's manager had assured Ron that there were no emails. Few, apart from Grand Prix dot com, are seeing beyond these snippets of gossip to the larger picture. What has happened amounts to a travesty, a legal fudge of monumental proportions that is self evident from the transcripts. It is quite clear that the WMSC wanted to have its cake and eat it. Right at the beginning of the first meeting, Max Mosley had this to say: "I would also add that this is not a Court of Law, still less is it a criminal court." Good point, Max, let's keep this thing strictly to the remit of the committee - the sporting code. The problem is that the committee then happily sally forth into legal and criminal matters that are none of their concern. Theirs was not to establish whether McLaren had gained access to the Ferrari documents and used them; their brief was only to establish whether F1 had been brought into disrepute and, if so, whether McLaren was responsible. This was never addressed, it being assumed that, if McLaren were guilty of industrial espionage, the disrepute would naturally follow. Apart from the fact that the committee had no business deciding on a matter already schduled for the properly constituted courts to rule upon, it does not automatically follow that the inevitable consequence of a guilty verdict is a slur on the image of F1. Far more likely, in fact, is that it would bring McLaren into disrepute. Having ventured into the arena of legal prosecution, the committee then proceeds to conduct itself as anything other than a court of law, accepting inference over sworn statements, untested evidence that was adequately explained by witnesses and preferring the opinion of one side of the argument over that of the other. The whole transcript is an excellent example of why we have a legal profession and allow professionals to sift and test evidence before it is submitted to trial. Inference and supposition have no place in deciding the truth of any matter; what seems likely often turns out to be wrong and the unlikely shown to be the truth. Who cares whether Max feels it unlikely that Coughlan communicated only with de la Rosa regarding the documents? It does not matter whether the entire world are of that opinion - until it can be proved that communication went beyond that, no opinion is of any concern to the truth. You cannot convict on the grounds that something is unlikely in your opinion. Yet this is the sum total of the FIA's new evidence - supposition and inference. Not even a committee ruling on a matter of the sporting code can justify a guilty verdict on such grounds, let alone a court of law. To then impose a penalty out of all proportion to the alleged offence is to stray once more beyond the stated limits of the WMSC's remit. It may be that the committee will justify its actions by saying that they must penalize an offence against the code but they must recognize that McLaren do not operate only in the sport. They may exclude from their competition but they may not impose a financial penalty that threatens the livelihood of hundreds of people in the real world. The whole thing is a fudge. When it suits the committee, they are not a court of law, when they want to behave as a court, they happily stray into the area of civil and criminal litigation. What the transcripts reveal is not just an unhappy relationship between a team owner and his driver, but the inadequacy of FIA structures to administer a sport in the modern world. The governing body needs complete re-organization to prevent one man having the power to rule over the sport as Max Mosley has done for far too long. It will happen. Now that the manufacturers are the dominant force within F1, the situation cannot continue in its present form. We are about to see a power struggle that will end in an entirely new format for the governance of the sport. It cannot come too early, in my opinion. "Tell Charlie Whiting to go into McLaren to go into the organisation and not return until, having checked it from top to bottom, he is satisfied that no use has occurred. That has not happened; I don’t know why. "I do, however, know that if you convict us today without the FIA having done that, that will be the grossest misjustice in my professional experience." I disagree, although I do believe that it was handled completely wrong (how many people will have double rear master cylinders next year? ), to do nothing would have cause just as much of a backlash. The facts are that McLaren had information of Ferrari's and only made the Fia aware after Alonso's threat to expose it. By being in possession of those documents you are guilty by association. By having them within your company and NOT knowing about them shows gross incompetence. By giving the drivers immunity by cooperation, (which The Ham didn't and still didn't face any consequence) if this were to ever happen again the driver would be more likely to come forward and save his own arse! Lets face it, the only way this could have ever ended with everyones approval would be if it never happened in the first place. The whole thing has been something of a fiasco. As I have said, the idea that 'bringing formula 1 into disrepute' constitutes any sort of legitimate offence (what does it really mean? who judges? what constitutes disrepute? how does one decide when F1 as a whole has been brought into disrepute, rather than merely certain individuals within it? Does this mean that the law applies differently to different teams because when a minor team breaks the rules, they bring opprobium only to themselves, while when a major team does, it affects the whole sport?). The one person who certainly committed an offence, of course, was Nigel Stepney. Quite right, Patrick. To me, one of the most astounding facts in the whole affair is that Max is supposed to have had training as a lawyer. As such, he should know that what happened in the WMSC meetings bore no relation to a proper investigation into the matter, regardless of what they saw the offence as. It is hard not to draw the conclusion that this was a personal matter between Max and Ron. I wonder which list is longer: those in all of F1 who are blameless in this affair, or those who aren't? Looks like this story isn't going to die down even after the hearing last week! I agree that Ron doesn't appear to have known about what was going on in his organisation - and that must be of concern, not least to Ron himself. He is the figurehead, the public face of the company, and it can't be nice for him to be out there saying X and Y have happened or not happened, when it would appear that they actually have - it's just that nobody told him about it. McLaren like to share responsibility around, which is admirable and probably necessary in a company of their size, but the people holding that responsibility must know how to handle it - and be good judges of what to do in certain situations. Probably (and hopefully) that's not the case and certain McLaren employees simply made the wrong choice in the heat of the moment. After all, had Coughlan or another McLaren employee taken the evidence to the FIA straight away then no charges could have been levied against them and any FIA penalties would surely have been aimed directly at either Ferrari or Stepney himself - although how likely is that? Hopefully all concerned have learnt their lesson, and we can chalk this one up to experience. It would be nice if this was the end and we could all return to motor racing, Craig, but somehow I feel that this one has created too many waves to be forgotten. Apart from the pending court cases, there are matters raised by the FIA's conduct that participants in F1 can no longer ignore. We may find it easiest to dismiss it as a monumental blunder by McLaren but the other teams must be wondering if they are next on the FIA's agenda. I could be wrong, but I have the feeling that the WMSC has started something that will not stop until much that is wrong in the way F1 is governed has changed. Well, unless anything new comes up - like McLaren's apparent attempts at mudslinging by trying to involve Renault in all this - then I'm not going to say anything else about this. If this really is a Max -v- Ron situation though as most seem to think, then the other teams should be safe enough! As for the WMSC and the FIA's position in all this - only the teams have the power to change the system, nothing I say on the matter will make any difference so I'm going to leave that to others to sort out! Well, that's true, Craig - all we can do is sit and watch how things develop. My thinking behind this is that this ruling was meant to be a warning to all other teams. Something of a "cut off the head and the body dies" type of ruling. By docking the top team it shows all the teams that no one is safe from fowl play. The main job of the Fia is to ensure the integrity of the sport, they don't need to do it by the books, this isn't a court of law. maybe they screwed the 07 seasons but it ensures we wont have this problem in the future. The only thing I wish they did do was take all prize money won this year and give it to charity (show you care about the average viewer). What they have done by not taking prize money is tell the other teams that if you manage to find an unfair advantage, you can use it and keep your prize money, we'll just start punishing you from the time we find it. Look at all the issues that have started to come to light after this incident. Suddenly Renault seem to be involved as well as Honda screwing SA. Will they be taking any chances in '08? Everyone seems to have an opinion of why this ruling is unfair, so I ask you, how you would please everyone? Were the FIA consistent in their application of the rules, Dan, I could accept that their intentions in the "McLaren Affair" were pure and holy. But their actions in the past have shown that they pick and choose who they will penalize, examples being the Toyota use of Ferrari information that went completely ignored by the FIA, the ridiculous mass damper ban of last year, obviously intended to handicap Renault to give Ferrari a chance to catch up and the intractability that caused the Indy farce of 2005. I can only presume, therefore, that the dubious finding of the WMSC against McLaren and the resultant penalty was not motivated by a concern for the purity of the sport but by a desire to give the championship to Ferrari, coupled with Max's famed dislike of Ron Dennis. You make the point that teams will think twice before indulging in any underhand practices in the future. But this is not so, since the message is that only those teams that can compete with Ferrari have anything to fear. Such inconsistency in the governing body of the sport is unacceptable and it is time for change. I don't accept, either, that it is the governing body's job to please everyone. Whatever they do is going to displease either Ferrari or the rest of the teams. But we have the right to expect them to be even-handed in their application of the rules and to be fair in their handling of disputes between teams. What would I have done? I would have waited for the result of the pending court cases before deciding unilaterally that an offense had taken place. So apparently it was all because Ron was going to become Sir Ron this year and Bernie and Max for different reasons can't be knighted so they conspired to sully McLaren's reputation. Makes about as much sense as any other justification. Well, Alex, it's quite apparent from Max's comments after the hearing that he was enjoying things immensely - and many of his statements make no sense unless interpreted as barbs at Ron. I don't know why there is so much enmity between the two but it's obvious that there is. Seems to me there was a lot of fudging on both sides but the killer for McLaren was that they conveniently kept the Stepney channel open...just in case. Why did they not just got to the FIA rather than set up this supposed "firewall"? one can only conclude it's because they hoped to take advantage of it. I am glad you said "sides", AC, since that is exactly what took place in the WMSC meeting - there were two sides, one was McLaren's, the other was the WMSC's. What business does any committee intending to find out the truth have in taking sides? Enough said on that score. My article is concerned with the extent of the WMSC's jurisdiction; it does not involve itself in the various details discussed at the meeting but considers to what extent the WMSC has exceeded its remit. So such details of why communication with Stepney continued are beyond my self-imposed remit. However, I do have a few things to say on the details (and intend to write a post on one of them today, no doubt accompanied by the groans of my long-suffering readers). So I'm prepared to look at this matter of communication with Stepney. You say that McLaren kept the channel open - but that is the essence of what the meeting was supposed to find out: whether it can be said that McLaren was responsible for what happened or it remains the fault of one man, Mike Coughlan. McLaren gave sworn statements that, to the best of the knowledge of the McLaren bosses, the communications had been stopped. If you or the committee want to say that they allowed it to continue, you must prove it. And the emails, if we accept them as genuine, are proof only that Pedro de la Rosa received some information from Coughlan and that he knew one item at least had come via Stepney. If de la Rosa is McLaren, I think he should be informed - he thinks he's not even an employee but an agent of the company. You see the problem? We are in the area of supposition and inference, guessing that, because the info went so far, it must have gone further. As bloggers, we can do this but a court attempting to find out the truth cannot base its findings on such constructions in the air. Truth is stranger than fiction and what we guess will happen most often turns out to be wrong - ask any betting man. As disappointed as I am that Mclaren was involved in this I see this as a very simple matter: they got caught. There is an understandable amount of hemming and hawing on their part and a lot of equally understandable amounts of, to borrow a phrase from the Bill Clinton scandals, define the meaning of "is".... but the fact remains, they got caught and worse they were less than honest about it. I have a hard time buying the Ron didn't know line and De la Rosa himself admits he's not an engineer or the person responsible for deciding the substance of tests. It just seems awfully convenient to exclusively pawn this off on Coughlan and DLR...what, now the number of "rogue employees" has gone up to two? On the plus side Dennis seems to have faced the obvious and has taken his lumps and I bet he'll even end up making money out of this in the end! 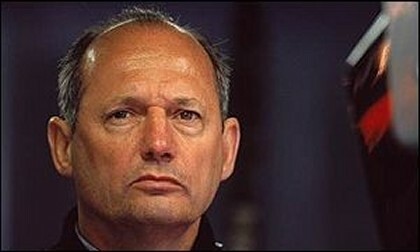 Maybe I'm gullible, AC, but I believe that Ron Dennis is telling the truth. It's a subjective judgement, like so much in this affair, and something we can argue about till the cows come home but never reach a conclusion. I do think that a committee charged with finding out the truth should base their findings on something more than inference, however, and that is really my main point. We like to operate on the basis of complete transparency. If you wish to press that point, you are absolutely free to do so. We will hear your comments, then consider them in closed session. Why are there no questions aimed at Ferrari in all this? After all, if there is wrongdoing, it is also that their IT or file security is so lax that one employee (one they should have had their eyes carefully on for a long time) was able to remove and send off such documents...to be fair, Mclaren didn't ASK for or PAY for these documents - the were sent by a bitter Ferrari employee...for all we know (and here's a good conspiracy theory), Ferrari set up Stepney and Mclaren in the hope that they would be excluded simply because they KNEW Mclaren had a better car this year, and it would be a good way to ensure another constructor's and hopefully driver's championship. No, I don't really believe that part, but why haven't Ferrari's hands been slapped a bit for setting the scene in the first place? And I think you've answered your own question as to why Ferrari weren't examined for their part in the affair - Max. Did they do IT (on purpose)? Doesn't matter - did they get caught? Yeah, so they should be punished - but I shook my head and let out a big "HUH??" when I heard they were fined $100M! What is that all about? There's no way Ferrari would have won anything close, even if they were in an American civil court. The only reason Ron isn't applealling the verdict is because a) he's naive (my opinion), and b) he's hoping to, or already got confirmation that Ferrari will drop the other legal proceedings against them (which makes me think Ferrari will scrape off a sliver or two of the pie) and he thinks they will cost him more money or maybe even time in Italian jail. Talk about a God-syndrome. What sport would allow such a ridiculous fine? No, this fine did more towards destroying F1's credibility than the spy scandal did, or any of the last few years Ferrari cheats. I believe that Mclaren should take the FIA to court and have them (or at least Max) removed as the governing body - they should even blow the dust off the GPMA or whatever they called it and get the other teams on board because if Max gets away with fleecing an upstanding public company, we all know he'll do it again, and again. Honestly, what right did the FIA have to impose anything other than a nominal fine (I'm thinking 6 digits - not much more than to cover their legal bills) and yank their points? Can someone explain that one to me? I can only hope the manufacturer teams get together to ensure this never happens again, Scott. As you say, it brings F1 into disrepute far more than any wrongdoing by McLaren. Silly Season! I just read that Massa may be looking at Toyota for next year, paving the way for Alonzo to join Kimi. In one sense it doesn't make sense since Kimi won't bow to any other driver any more than Alonzo will, so his preferred #1 status still won't be found at Ferrari. ...but if he DOES move there, what a wonderful opportunity for Ron to get his money back - I would say that Alonzo moving to Ferrari should cost Ferrari, oh, about a hundred million bucks!! THAT would be funny. Agreed, Scott. In fact there would be something especially apt in the move. Although Kimi will be the problem for Alonso, otherwise he and Ferrari are well suited to each other. Badly need your help. Best wide-angle lens? Two steps backward. Look for the 'ah-ha'. I am from Cuba and now study English, tell me right I wrote the following sentence: "Coleccion de miles de fotos de carros gratis levothyroxine synthroid drugs." :o Thanks in advance. Terran.